Today was day three of Mercedes Benz Fashion Week in New York City. This morning I attended the Ruffian fall 2014 runway show. 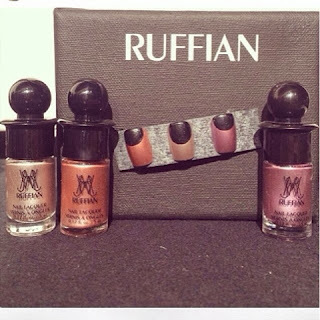 I was especially excited for this one since Ruffian released their own nail polish line with Birchbox! You can always expect nail art on this runway. For today's outfit of the day I wore Trina Turk's Mandahl Ponte dress, black leggings from H&M, an Iris leather jacket, Vince Camuto Winchell boots, Michael Kors Quilted Studded Hamilton tote and a statement necklace from Modcloth. To match my dress I created some black and purple Ruffian nails! The Ruffian pattern first appeared at Ruffians 2009 fall runway show. I used OPI Black Onyx on the base along with Essie's Boxer Shorts layered on top. The show started off with bold leggings and flowing garments. This organic gold print was reoccurring this season. I loved Ruffian's dresses! This gold printed dress had a great fit and I loved the flared skirt. The Ruffian collar showed up a few times this show with a nod to the Renaissance. The layering of black and white on this garment made for a very interesting effect during the walk, almost like a birds wings. This dress had a delicate trim to the bottom that I was really feeling. So it wasn't too red overall with matching of the tights, a stark blue was paired with these. Again is that recurring gold pattern in the coat. Here we see the oversized Renaissance collar. The sleeves also recall an older time. The busiest print of the show is displayed here on the high waisted pants. Some of the hats the models wore were reminiscent of Renaissance style military helmets with high narrow sides and sharp angles on the edges. This was my favorite look of the entire show! The dress had linear long white lines enhancing the feminine shape. This dress has a mod style cut being baggy with sharp lines but retains the baggy sleeves with a tight wrist from the Renaissance style. Sets! This skirt and jacket set use the same print and create a beautiful business chic effect. The high collar on this model's blouse is reminiscent of early priests. The music at the show had a monastery feel to it with gong ringing and chanting. This gold and black pattern was reoccurring through the show. This hat and coat set really show the metallic catching the light. Oversize has been everywhere this season! I loved this entire look. From the hair to makeup to shoes, tights and garments! The red lips really set off the tights. Later in the show there were a few of these long coats. They have pleating towards the top and are tied around the waist with large bows. I'm loving the cinch of the waist for shape and how the pleating keeps it's folds on the top but fades away after the waist tie. Very complex! This look closed the show! Everything Ruffian was going for this season is here. The Renaissance influence is seen in the collar and sleeves but, the more modern touches are seen on the skirt and red lining on the bottom. The metallic sheen of the skirt is there as well. One of my absolute favorite parts of this show was the shoes! All shoes from this show were from Walter Steiger. The models wore heels or wedges, all of which had a bowed out heel, Steiger's signature style. I want to wear a pair of these just to feel what the balance is like with the weight being a bit further back. The organic shape of the heel curving really gave a modernity to the collection as well as tied all the looks together. I'm thinking boyfriend needs to get me these for Valentine's Day. Who needs chocolate when there are stilettos? Ruffian always has classy, unique nail art. This season they they went with an enhanced half moon mani dubbing it the 'lunar eclipse moon manicure'. Instead of keeping just the half moon covered, the semi circle is pulled out and to the middle of the nail using black, hence lunar eclipse! The three metallic shades selected for the nails all tied into the shades and metallics seen on the runway. These three Ruffian shades of polish are exclusively available through Birchbox and unfortunately you won't be able to snag them until this May. On the models you can see a hint of blue sheen on the lunar eclipses! Nail art was done by Cheryl Natoli, a freelance nail technician. I'll have more fashion week posts this Monday and then I'll be posting some Valentine's Day nails! What did you think of the Ruffian fall 2014 New York Fashion Week runway show?